Former Defence Secretary Gotabaya Rajapaksa did not deserve more protection, Minister Field Marshal Sarath Fonseka said yesterday. Speaking to the media during a visit at Nandimitragama in Vavuniya, the Field Marshal said that the security detail of former Defence Secretary was higher than what was given to him. “I have been given 17 Police personnel. But Gotabaya has enough protection. As far I know the former Defence Secretary has 25 security personnel from the Army, Special Forces and Commandos. “I have seen during a demonstration that he had the protection of the STF. I am not aware of the fact that Police protection was given after the military protection was withdrawn. But, he is well protected,” Field Marshall Fonseka said. He said he was cordoned off by 500 military personnel during the war. “But it is not necessary now because of the situation in the country. Former Defence Secretary is a normal citizen. He is not holding any responsibility for the government or for the people. He is not legally entitled to Presidential and Prime Minister or even a Ministerial protection. “As far as I know, no secretary was given a protection once he retired,” he said. 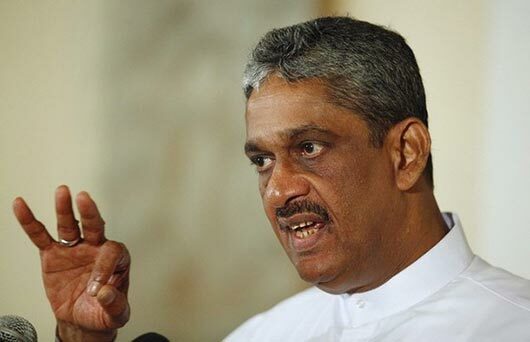 Field Marshal Fonseka said that there were so many people in this country who had death threats and the country’s money would not enough if all of them were given bulletproof vehicles. “If he was scared for his life, he can leave the country because he has a US citizenship,” Fonseka said.